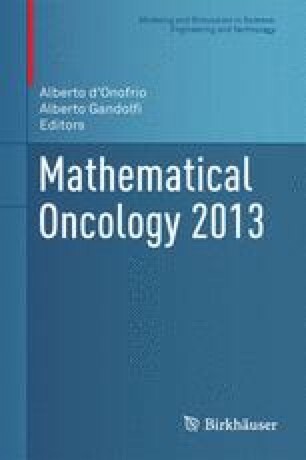 This paper is a review including some original elements of a family of reaction-diffusion models of carcinogenesis exhibiting diffusion-driven (Turing) instability (DDI), but consisting of a single reaction-diffusion equation coupled with a system of ordinary differential equations (ODE). Such models are very different from the classical Turing-type models in that they exhibit qualitatively new patterns of behavior of solutions, including, in some cases, a strong dependence of the emerging pattern on initial conditions and quasi-stability followed by rapid growth of solutions, which may take the form of isolated spikes, corresponding to discrete foci of proliferation. However, the process of diffusion of growth factor molecules is by its nature a stochastic random walk. An interesting question emerges to what extent the dynamics of the deterministic diffusion model approximates the stochastic process generated by the model. We address this question using simulations with a software tool called sbioPN (spatial biological Petri Nets). The picture emerging suggests that some of the generic features of the deterministic system, such as spike formation, and dependence of the number of spikes on diffusivity, are preserved. However, new elements, such as spike competition and appearance of spikes at isolated random locations, are also present. We also discuss the relevance of the model and particularly the cell cooperativity hypothesis, underlying transition to the DDI.